On our very first Eco-Monday, I'm very excited to share with you the most adorable (and Eco-friendly) baby store﻿ that I just discovered. Babies by the Sea boutique is located in Cardiff-by-the-Sea in San Diego. With so many friends and family members having babies these days, I've been doing my fair share of baby shopping. But up until now, it's been rather ordinary. When you walk into Babies by the Sea, it feels as if you're walking into an earthly fairytale. Every organic detail has been meticulously perfected to offer the most enjoyable shopping experience for babies, toddlers and their parents. The concept of the Babies by the Sea Boutique was conceived by San Diego Obstetrician and Gynecologist, Dr. Robert Biter who has been a proponent of natural women's and babies’ health care for years, and Laura Ann Fairchild, an entrepreneur, retail fashion consultant, and the creator of the successful L.A. Fairchild Boutique and L.A. Fairchild Denim Bar concepts. They realized that with Dr. Biter's medical expertise and passion for health, and with Laura Fairchild's cutting-edge eye for retail fashion, buying ability, business knowledge, and familiarity with corporate start-up operations, a partnership between the two of them was a match made in baby boutique heaven! 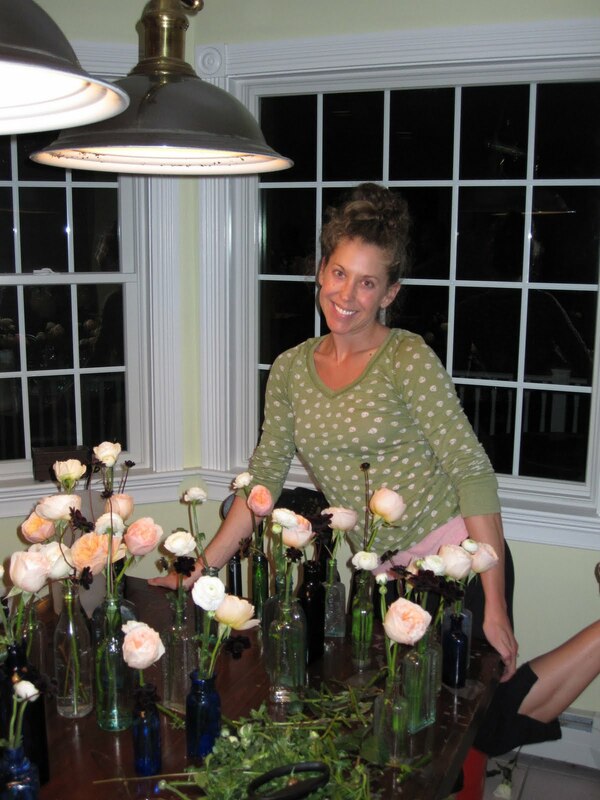 In addition, Laura's sister and business partner, Julie Fairchild, enthusiastically decided to join the team to handle marketing, events, and human resources for the store. And I must say, this collaboration is perfect! Their Mission Statement says it all: Our mission is to empower healthy beginnings and support sustainable families by offering cutting-edge natural-living resources and products, in-depth educational opportunities, and fashion-forward organic and boutique apparel; and to create a nurturing, open-minded, non-judgmental, accepting of difference, multi-cultural social network to meet the evolving physical, developmental, intellectual, and emotional needs of all mothers, babies, and toddlers. And check out how they designed the boutique: The store build-out was thoughtfully designed based upon a sustainable and environmentally-friendly "green" premise. Materials and themes incorporated into the build-out include the use of bamboo for shelving, recycled pallets for display tables, burlap coffee sacks for wall covering, reclaimed and salvaged urban wood for display tables and beams, recycled glass for the counter tops, no VOC paint, energy-efficient lighting, and other non-toxic materials wherever possible. 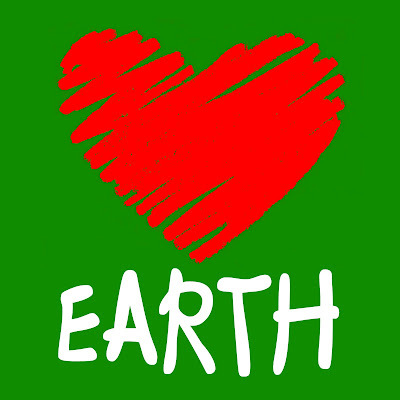 The store incorporates the use of earth-friendly office supplies, bags/packaging, water for customers, and other daily use items. The boutique also encourages customers to re-use bags and to participate in environmentally friendly family events, in order to raise awareness with respect to sustainable living in the community. I know what you're thinking...amazing! This is definitely my kind of store! Along with their amazing selection of organic and designer baby goods, Babies by the Sea also offers classes for soon-to-be and new moms. I'm not pregnant yet, but when I am...I would love to live close to this store.﻿ If you're looking for a gift for a young one in your life, or if you're expecting your own bundle of love...and of course those of you with little darlings already - you MUST check out Babies by the Sea. To experience it for yourself, visit the boutique at 2007 San Elijo Avenue, Cardiff by the Sea, CA 92007 or visit their website to learn more. 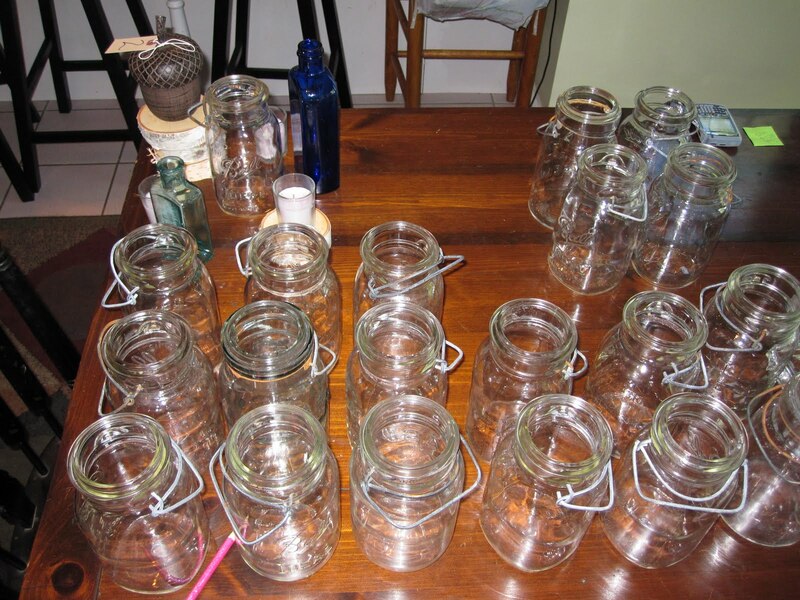 Eco-Mondays - Every Monday we will post a fun piece of Eco-Goodness for you to enjoy. And there are no restrictions here...it could be anything. 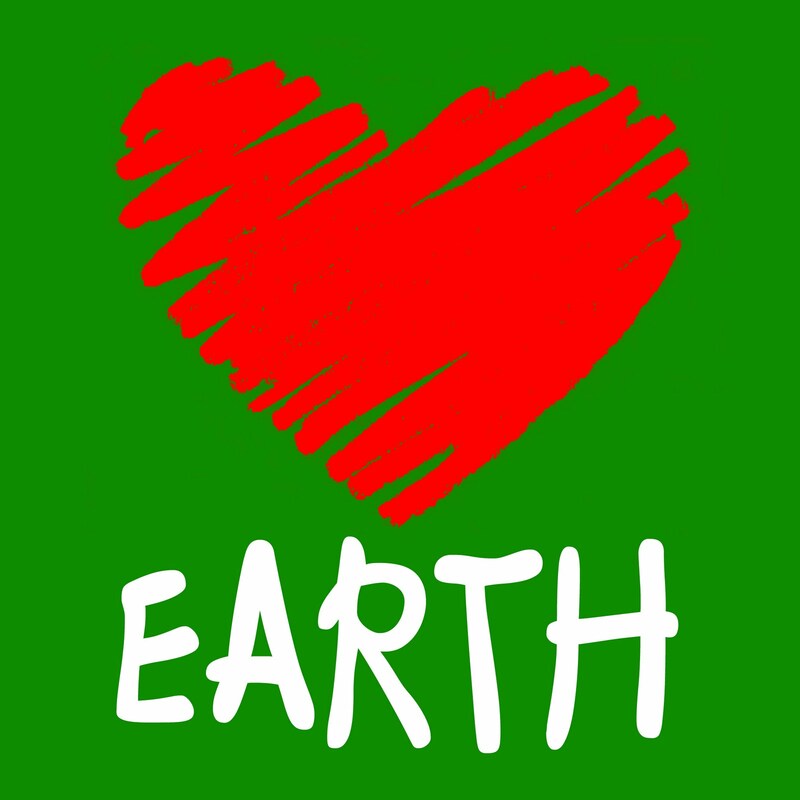 From cool products to exciting Eco-Events, to important Green News...or maybe just a useful tip. Whatever it is, it will keep you informed and help you expand your inner green goddess (or god?). Wedding Wednesdays - If you couldn't tell, we love weddings around here. And there are so many amazing wedding ideas, companies, blogs, products....etc. So every Wednesday we will give you some inspiring wedding delight! 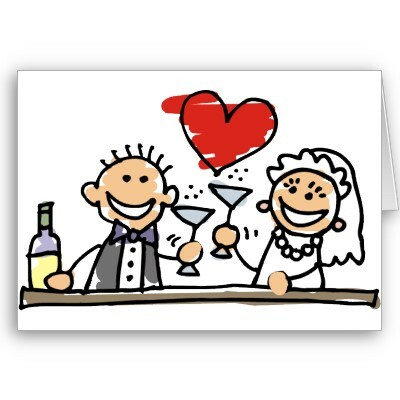 But weddings aren't our only specialty...we plan all sorts of events at Green with Envy. So if it's alright with you, we might slip in some tidbits about the other events we're working on too. Fun Fridays - We are party planners after-all...so obviously we love to have fun! And what's not fun about Friday? So every Friday we'll send you into your weekend with a little amusement and joy. Something that will make you smile. Life is short, and it's our belief that we should have as much fun as we can while we're here. You only live once, so make the most of it. And we'll do our best to help you do just that. With all the recent news Groupon and LivingSocial has been making, I thought it'd be nice to give a shout-out to a new type of Deal-of-the-Day Site; one where you not only get the disocunt, but you also do a good deed. 1. YOU SAVE: Visit their site, browse through their daily offer, and get great disounts on local restaurants, spas, sporitng & entertainment events. 2. GIVE BACK TOGETHER: Deal for Deeds works with local businesses to feature exclusive offers on a product or a service and agree ahead of time that a portion of the deal will go to the featured non-profit (This week, Miriam's Kitchen, which provides meals for the homeless). So when you buy a deal, a percentage of YOUR MONEY goes directly to a charitable organization. 3. WE MAKE A DIFFERENCE: From the funds raised on their site, Deal with Deeds helps non-profits achieve a certain goal. Whether it's 500 meals for the homeless or a new swing set for the neighborhood park, you can see exactly what you helped make possible. I commend Josh Hoffman and Harrison Miller for adding a creative twist to the discount business. Not only are they choosing local businesses to showcase on their site, but they also look to partner with businesses who incorporate an element of environmental responsibility and awareness. Everyone loves to get a good deal, but now you can enjoy that discounted massage knowing you did your good deed for the day. A few months back, Green with Envy Events made their way to a beautiful, small Massachusetts town for the wedding of Shannon & Chris Boeckelman. This was no ordinary wedding. This was rustic, romantic elegance at it's finest! What made this wedding so extraordinary (other then the amazing bride & groom and their lively friends and family) was the FLOWERS!!!! Our bride Shannon chose to do all the flowers herself. With her amazing artistic vision and our design expertise, we pulled together a stunning floral presentation. And of course...I just have to share it with you. Enjoy! First step, the bride collected dozens of antique glass bottles (thanks to her uncle) and a bunch of bell jars. 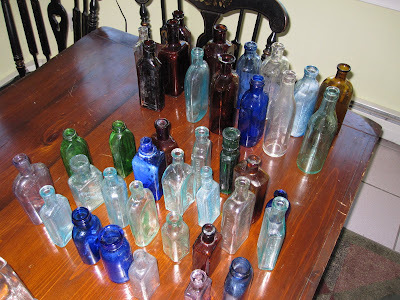 How cool are these bottles? Next up...the flowers. 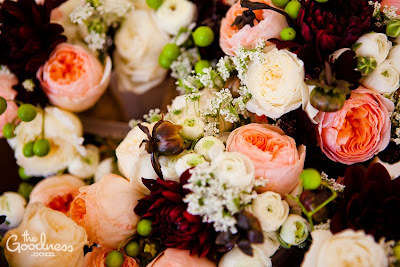 Our bride ordered all of her flowers from FiftyFlowers.com. 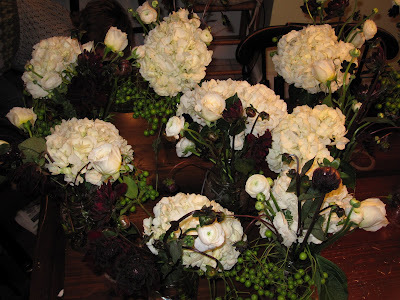 This awesome site offers over 2000 flowers choices, at wholesale prices. 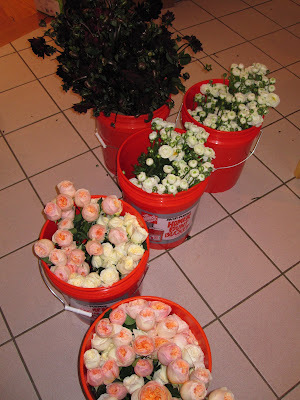 Delivery is timed perfectly for optimum freshness of your flowers. Shannon and I worked together to choose the perfect combination of flowers. 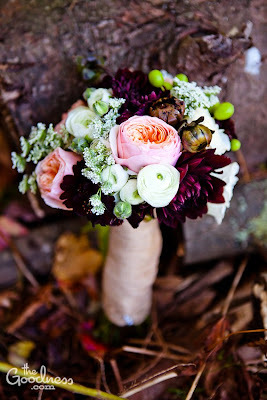 Our inspiration ~ Romantic, Rustic, French, Elegance. I think we nailed it! What you'll need: A team of eager-to-help aunts, sisters, and bridesmaids, a bunch of large buckets, lots of stem-cutters & sharp knives, stem stripper, vases, rubber bands, paper towels, ribbon, green floral tape, pearl tipped corsage pins, and a good 5-7 hours to put it all together. Now you're ready to go. 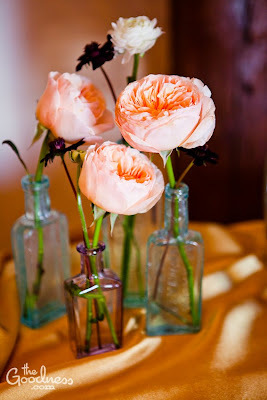 What made these flower arrangements so pretty, was that they looked effortless. 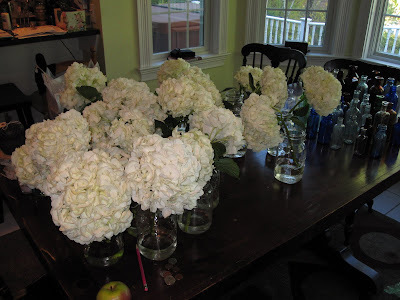 Large bunches of hydrangeas, black cosmos, ivory garden roses and china berries went into the bell jars. 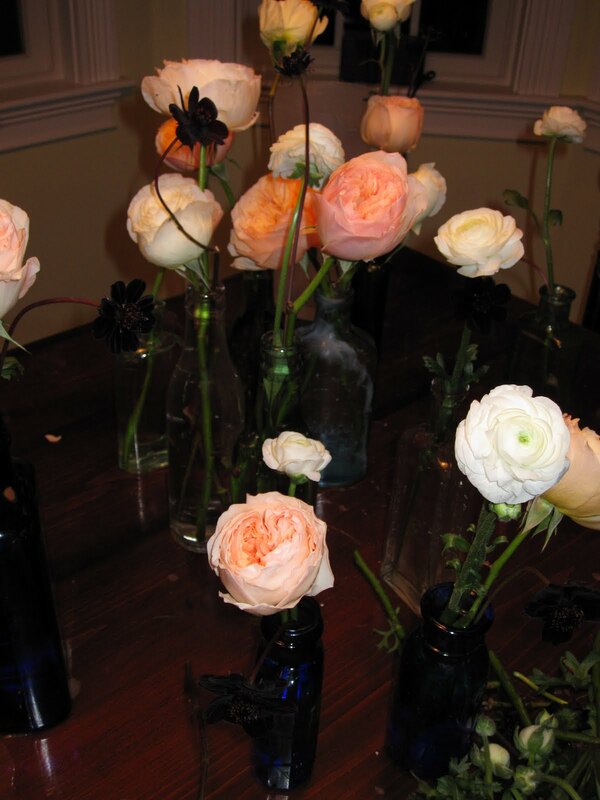 A beautiful combination of peach and ivory garden roses, chocolate cosmos, and white ranunculus went into all the antique bottles. How darling are these? Our beautiful bride is getting excited for the big day!!! Next up, the bouquets. There are tons of DIY wedding bouquet articles all over the web; we like this tutorial from Wedding Bee. 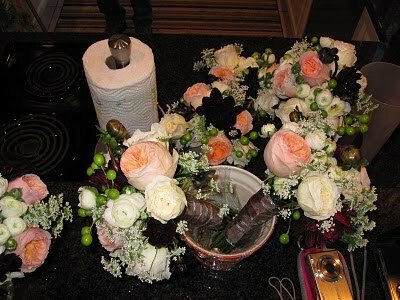 For the bouquets, we used all the different flowers and gathered them in a loose, flowing style. Rather then packing them into a tight ball, we had little bunches of china berries hanging out, Queen Anne's lace popping up, and some chocolate cosmos dripping out. They were stunning! And now...the final product. Check out these next few pictures from the amazing photography husband & wife team of The Goodness. Lisa and Geoff are some of the most talented photographers in the business. And on top of shooting pictures, they also do incredible design work. I absolutely adore the centerpieces we set up. 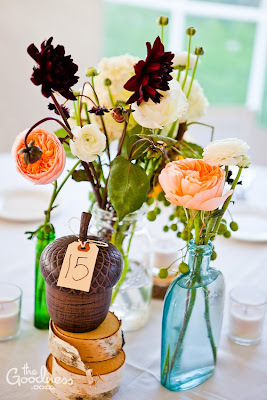 A combination of 3-4 antique bottles, one bell jar, small votive candles, and a stack of sliced tree trunk (courtesy of Richie, the father-of-the-bride) topped with an adorable acorn with the table number. LOVE!!!! Thank you to Shannon and Chris for letting us be a part of your big day and congratulations on your marriage! We wish you a lifetime of happiness together! As you can see, when you put your thinking caps on, a get a little creative - the result can be breath-taking! We encourage anybody who's in need of flowers to consider doing it yourself. You'll not only save money, but you'll have a lot of fun doing it. Happy New Year to all our Green with Envy Events fans!!! As we say goodbye to another year, and welcome in a fresh new one...we at Green with Envy Events are ready to put a fresh face on our Blog. What does this mean for you? How about more postings, better articles, guest appearances, special offers, and so much more. The blogging has slowed down a bit over the past couple of months...and we apologize for that. 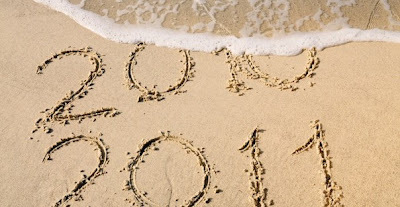 But not to worry, we are back in action and ready to Blog our way through 2011. 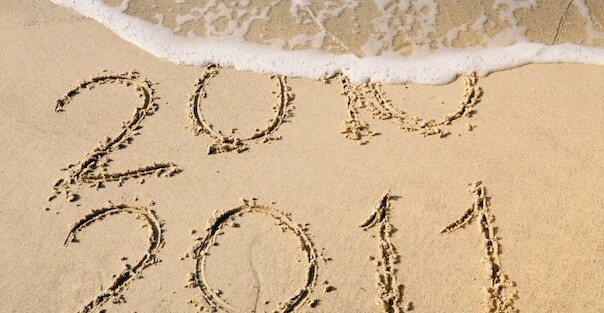 We're looking forward to hearing from you, and we wish you the most happy, healthy, and prosperous 2011!